Thank you for visiting the Play 4Less Card website! On this site you may buy cards and plan your activites. You may also learn more about each of the participating venues in the program, view participating venues, view venue websites, view maps and more. 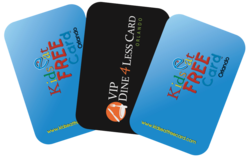 To date, Play 4Less Card has partnered with amazing venues in an effort to provide each of our guests a tremendous value when vacationing with their family. • Browse through our website to discover the venues and deals that are perfect for you. • Present the Card and Spend Less! Unlimited savings potential. The more you use, the more you save!